Windows Phone 7 has tight integration with social networking, especially Facebook. You can see live updates from your friend on the what’s new tab. When you add a Facebook account to Windows Phone 7, your Facebook friends will be available under contacts. Now if you have lots of Facebook friends, this might cause an inconvenience as the contacts would be a long list. 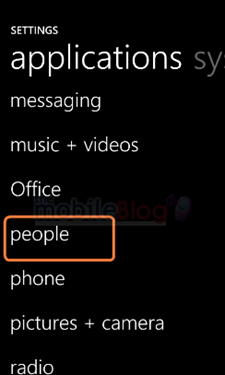 You can disable or remove Facebook Friends from Appearing as Contacts in Windows Phone 7. Open Windows Phone 7 Settings. Navigate to Application settings -> People. Under Include Facebook friends as contacts, press Only add Facebook information to existing contacts to filter out Facebook friends who don’t already have a contact card on your phone. Now you can see only Facebook friends who are already there in your contact list.